Winter running is in full effect here in the intermountain west. 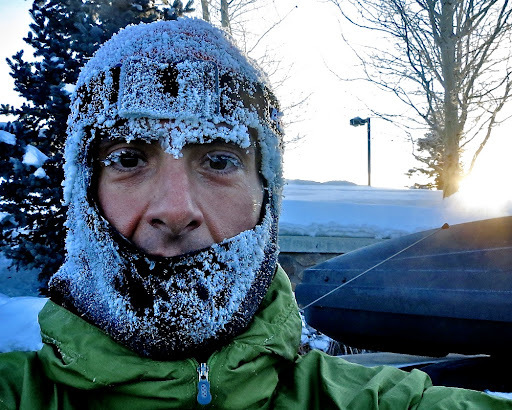 Yesterday, the temperature dropped to -20F, and being - like many of my esteemed colleagues - a stubborn runner, I didn't let the threat of frostbite deter me from my pre-determined plans for a road run in and around Sun Valley. I will admit to cutting the run a bit short, though, when parts of my face began to ache after 10k even though I was wearing a full balaclava and had Kiehl's Non Freeze Face Protector on my exposed skin (see #7 on the "No Excuses Guide to Winter Running"). It seemed a prudent move as a number of friends made their way to urgent care later in the day for some frostbite therapy. The rest of the winter may seem mild here on out.